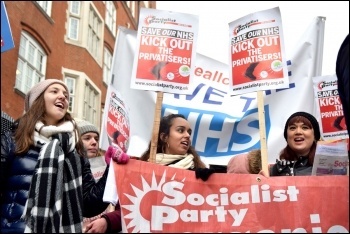 Socialist Party :: Hands off Teignmouth Hospital! Occupying a site which is a developer's dream, the CCG promised bed refurbishment two years ago. Now, the CCG claims that the success of the 'Care Closer to Home' regime - set up for those discharged from the main hospital in Torquay - means that 'beds are no longer needed'. When challenged, the CCG and NHS trust have no clinical evidence of the success of this policy. The Care Quality Commission has produced reports of the main private providers of home visits being of a low standard! Low pay, inexperience and lack of training was in their reports. Socialist Party members are working with Save Our Health Services Devon to mount a campaign to stop the closure and reinstate the beds/wards in Teignmouth. The 'consultation' process is now seen as a sham as the CCGs have devastated Devon with the closures of many community hospitals - "a done deal" is the refrain from some local people. The cynicism towards politicians and the CCG is well-founded as research has shown how billions of pounds of NHS property has been sold off to the rich. However many are willing to fight this undemocratic process. A protest march has already taken place and a rally is now planned for Saturday 2 June. UCU conference: Members are organising and winning - build the union, build the struggles!